SPECIAL ONLINE VIDEO FEATURING THE SEAGULL! "The book makes pleasant reading, with so many eye-catching still photos and a well-balanced story of Edna's private and professional life." 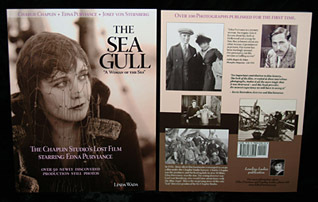 Over 100 photographs published for the first time, including over 50 recently discovered The Sea Gull production still photos from Edna's personal collection owned by Edna's grand nieces, the Hill Family. Extensively researched and documented, the book is a rewarding experience for lovers of Edna Purviance, Charlie Chaplin, Josef von Sternberg and the silent film era. Book design and layout by Wesley Wada. 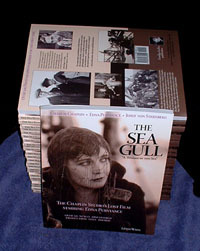 February 15, 2010: all books sold and shipped are Third Revised Editions. First and Second Edition has been retired. Video Link to see more of this version of The Sea Gull. 8-1/2" x 11", full color, 132 pages, printed on 70# quality paper stock. with special 4"x6" bonus photo with Priority shipped books only. A thumbnail view of most of the pages in the book.